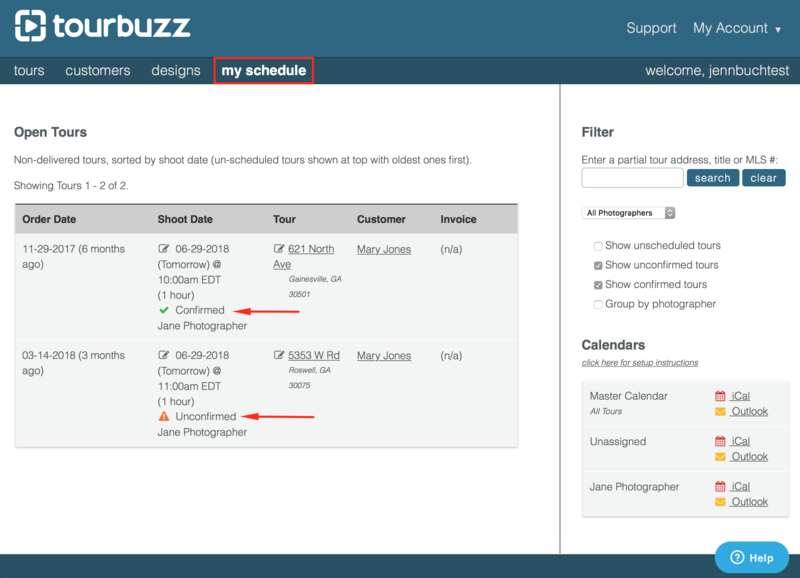 TourBuzz helps you efficiently manage your time with integrated calendar compatibility. 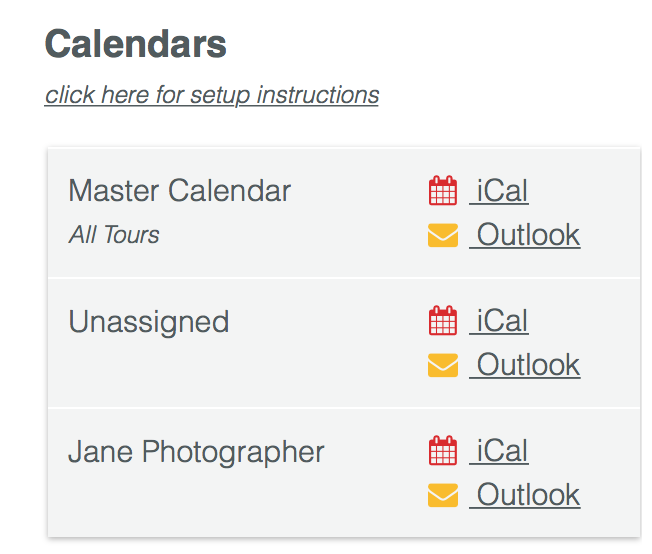 The "My Schedule" section keeps a list of your scheduled shoots that can be exported to your preferred calendar service (Outlook, iCal, Google, etc). 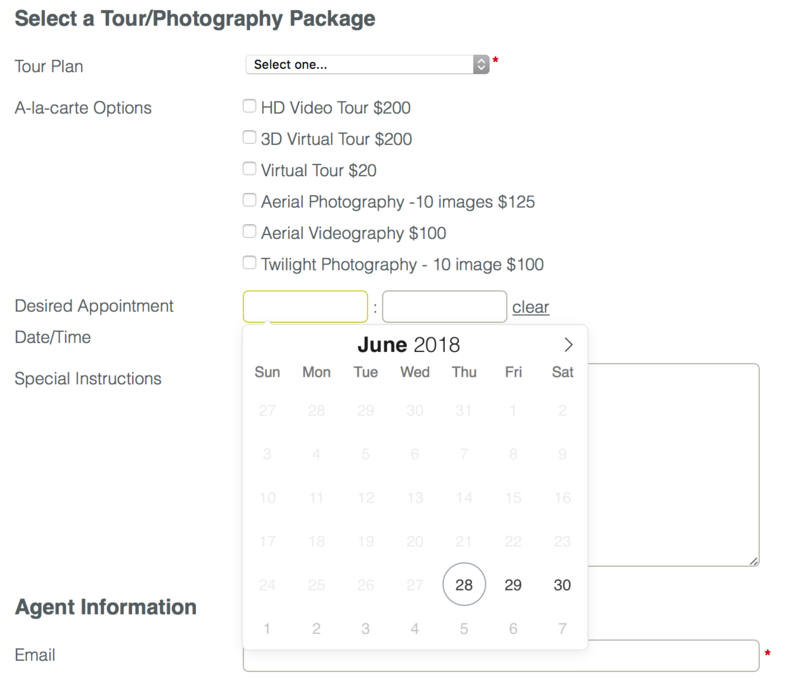 Through the Order Form: When a client/agent places an order through your TourBuzz order form, they have the option to select their desired Shoot date and time. This will be reflected within their tour. Directly in the Tour Information: You can enter/edit the shoot date & time within the Tour Order Info section of the tour. 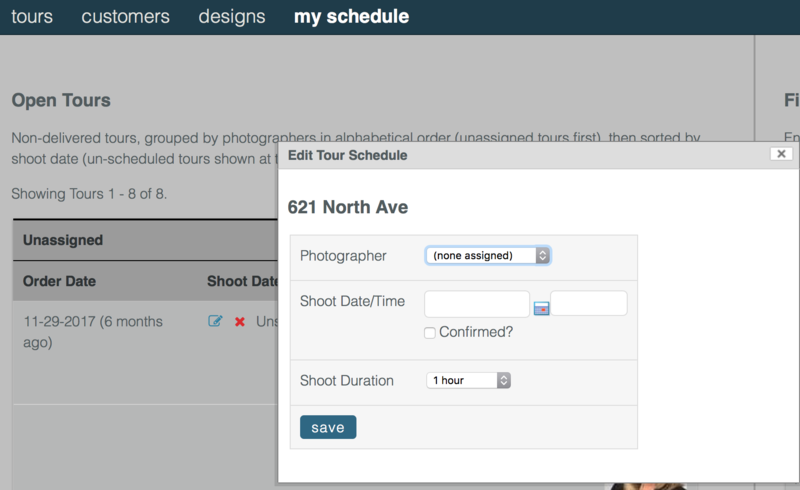 On the My Schedule Page: Click the icon under Shoot Date. A box will pop-up, allowing you to make and save your changes. Shoot Date/Time - Use this for events taking place in the future so they will be added to your personal and TourBuzz calendar. Confirmed - Selecting this option will automatically send an email to the customer, co-customer (if applicable), and photographer (see photographer management), notifying them of the scheduled appointment for shooting the property. Shoot Duration - This will block out the desired amount of time for the calendar event. To view all your upcoming tours, go to My Schedule. The list will automatically show Unscheduled tours at the very top. You can see below, if a shoot is confirmed, there will be a green check mark next to it, and if the shoot is unconfirmed, there will be an orange warning sign next to it. You can use the options to the right to filter a new view. You can export your schedule to your personal calendar by clicking the iCal or Outlook link. Once added, you will be able to see Tour location, date and time of the shoot, whether the shoot has been confirmed, the Customer and their contact number, along with links to the tour itself. 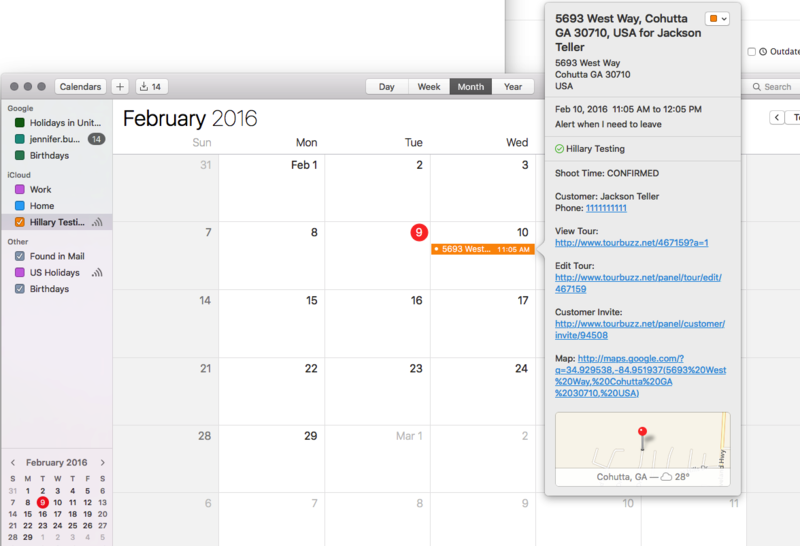 To add the calendar to your personal calendar on your computer or mobile device follow the instructions for Macs, Windows, Androids, iPhones/iPads, or Google Calendar. This also works if you have photographers enabled in your account. Each photographer gets their own schedule, and as the admin, you can see everyone's schedule as well as a master schedule. To learn more information on this, please see our article on Photographer Management.